Granite cliffs, dark forest, rushing white rivers, and streams where the mountain water is so clear you can see the trout mingling in the eddies. This is Northwest Arkansas, a land of great American wilderness and the intense natural beauty of the Ozark Mountains, but also a region speckled with idiosyncratic towns where you’ll spot biker bars next to health food stores bearing LGBT rainbow flags. Arkansas is of the American South, and yet apart from it as well. Other Southern states were historically defined by a class system of landed gentry, the working class and slavery. But Arkansas, with its countless valleys and hollows, is a place of small settlements populated by small-plot farmers and hunters. This dynamic makes for scattered population centers that feel dramatically different as you drive along winding mountain roads. In a state full of pretty things, the Ozark Mountains reign uncontested as the winners of the natural beauty pageant. A heavily forested, granite laced cordillera of flinty hills and wind-eroded peaks, these mountains form a stony knuckle that punches through Arkansas, Missouri and Oklahoma. A tough-minded independence and deeply felt spirituality are hallmarks of local culture, which is otherwise far too idiosyncratic to be easily described. 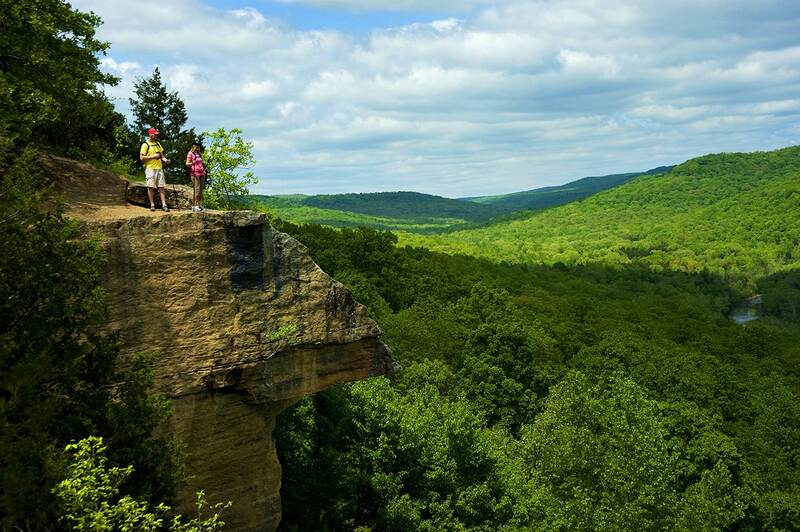 To explore this area, prepare for thin winding roads and plenty of trekking; you can find trails both casual and strenuous amidst the bluffs and white water of the Buffalo National River. Fayetteville, home to the University of Arkansas, combines this fierce sense of place with all the Bohemian sensibility of a college town. You can head to Fayetteville Square for the local farmers’ market, which promises a treasure trove of the Ozark region’s specialties. If you’re looking for an old-school date, head out to the 112 Drive In Theater, one of the few remaining in the state. For around $8 you can catch a double feature, which is as cheap as a movie gets in America. If you’re seeking nightlife of a more active nature, Dickson Street is packed with bars and clubs. If you’re in the mood for more cerebral pursuits and a chilled-out atmosphere, it’s hard not to fall in love with Nightbird Books, an independent bookstore that caters to Fayetteville’s large literary set. There are, of course, readings as well as locally sourced coffee, or beer if you need a sturdier drink. This being Arkansas, you’d be silly not to avail yourself of local sources of natural beauty, and it’s hard to top Devil’s Den State Park, an Edenic window into the Ozark backcountry. When you’ve worked up an appetite, head back to town to Hugo’s, a cozy basement den that whips up a mean burger. Many travelers may question why they should visit Bentonville, site of the corporate headquarters of Walmart. Well, this boomtown’s population has exploded over the last few decades and is a fascinating slice of cosmopolitanism. Because Walmart has so many corporate affiliates and distribution agreements around the world, there’s an impressively large international population out here, as well as many creative class types who work for companies like Pixar. The pride of the town is the Crystal Bridges Museum of American Art, created by the Walton family to house their enormous art collection. It’s a wonderful structure: a series of glass walkways interconnect geometric galleries, all positioned over a swift rushing mountain river. The museum is free to the public, and is adjacent to a lovely park that is peppered with sculptures and information on the ecology of the Ozarks. The Ozarks region is a land of many eccentricities, and no small town exemplifies local weirdness like Eureka Springs. Tucked into a gorgeous valley, this town mixes hippies and Harley Davidsons to surprising success. Start your visit at the 1886 Crescent Hotel, an architectural gem that, despite its 19th-century roots, feels more like a Jazz Age gem plucked from an F. Scott Fitzgerald novel. From here you can wander around Eureka Springs’ lovingly preserved historic district, a warren of stately mansions and enormous shade trees. If you feel like hiking, Lake Leatherwood City Park, located only 3.5 miles from downtown, is crisscrossed by some 21 miles of trails.